It was a Dipsea déjà vu. For the second year in a row, Chris Lundy, a 47-year-old San Francisco veterinarian from Sausalito, outlasted 32-year-old Alex Varner of San Rafael and his record-tieing performance to win the 108th Dipsea race. 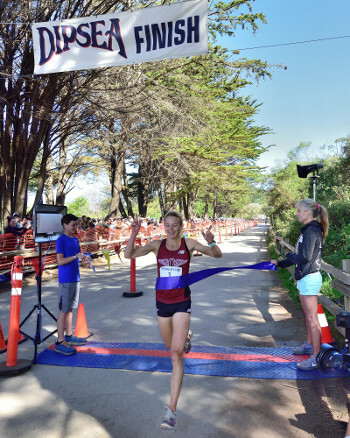 Lundy, who prior to last year experienced similar obstacles in winning the first Dipsea race of her career (three second-place finishes), started the 108th Dipsea in the same group as 58-year-old Mark Tatum of Colorado Springs. He briefly pulled ahead of her, but she ran away from him and passed the rest of the field by the time she reached the bottom of Steep Ravine. That allowed her to collect her second winner's trophy, which this year was officially renamed the Jerry Hauke Award. Tatum, 58, and Heath Hibbard, 65, also from Colorado, finished third and fourth, respectively, in their bids to become the first non-California resident to win the Dipsea since Coloradoan Gail Ladage-Scott in 1986 and first male non-Californian to win the race since Australian Joe Patterson in 1972. Two-time Dipsea champion Diana Fitzpatrick, 60, of Larkspur placed fifth, just ahead of Gary Gellin of Mill Valley, who was one of eight runners to win a coveted Dipsea black shirt for the first time for placing in the Top 35. 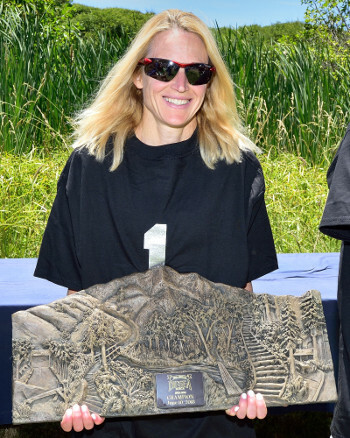 Jamie Rivers of Mill Valley, another two-time Dipsea winner, won her 19th black shirt, a Dipsea record for female runners. Lyle Rumon, a 15-year-old Marin Catholic student, won the fastest time award for a high school male for the second consecutive year. He finished a Dipsea career best 14th overall. Shannon McKillop-Herr of Drake High School recorded the fastest time by a high school female. Elena Shemyakin, 59, of Geneva, Ill. and her 35-year-old son, Mikhail, won the Alan Beardall Family Trophy while 34-year-old Jack McAfee of Knoxville, Tenn. was the first Dipsea Runner’s Section to finish. He passed at least 500 runners to clock an astounding time of 53:03, third fastest in the race. Varner, who dedicated his effort in memory of the late Linda Broderick Gill (who won the Fastest Female Trophy in 1995), led the Pelican Inn to its fourth consecutive Team Trophy triumph. His teammates were Gellin, Cliff Lentz (the mayor of Brisbane), Gus Gibbs of Boise, Idaho, and John Gardiner of Rancho Santa Margarita. Longtime Dipsea competitor and volunteer and Dipsea website webmaster Robb Briggs of Pasadena was recipient of the Red Tail Hawk Award for “Leadership, Dedication and Sportsmanship,” and Wolfgang Zech of Kentfield -- who has competed in more than 40 Dipseas and four years ago, at the age of 72, finished the race and later discovered that he had suffered a heart attack – was handed the Jack Kirk “Dipsea Demon” Award for “dedication, perseverance and performance over time.” Hans Schmid of Greenbrae, the oldest winner of the Dipsea at age 72 in 2012 who last year won a Dipsea black shirt at 77, was the recipient of the Norman Bright Award for “Extraordinary Effort in the Dipsea Race.” He suffered an injury during a workout on the track days before the race, yet decided to compete. However, soon into race, he realized he made a mistake. Still, rather than pull himself out of the race, he somehow managed to finish it.